You may still be able to book by calling the hotel at 281-501-4600. Boasting the signature blend of home-away-from-home comfort and the amenities of an established hotel chain, it’s safe to say that you’ll find something to love about the Four Points by Sheraton Houston, Memorial City. Each of the 171 guest rooms sports a warm, inviting décor that is as soothing as the room is well equipped. Standard amenities include complimentary high-speed Internet access, a flatscreen TV, cozy furnishings and the Four Comfort Bed, with its hypoallergenic pillows and 250 thread count sheets. The hotel also features a fitness facility with modern equipment, an outdoor pool for beating the Texas heat and a 24-hour business center should you need to get some work out of the way before it’s time to play. After all, who wants to think about work when you’ve got one of the nation’s best cities to explore? 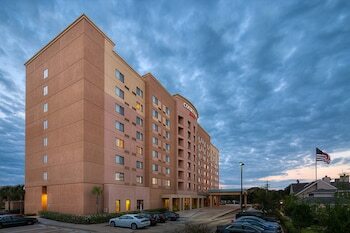 Four Points by Sheraton Houston - CITYCENTRE is a 3-star hotel located at 10655 Katy Freeway, Houston, TX 77024, US . Its nightly price usually falls between $89 per night and $334 per night, excluding tax, depending on room category. At Four Points by Sheraton Houston - CITYCENTRE, AAA members often get 7-13% off the regular rate. For example, on December 8, 2018, a AAA rate of $89.38 per night was offered. Depending on your itinerary, your savings can be more than the annual AAA membership fee itself! Many Room 77 users are able to pay for their entire AAA membership in a single stay. 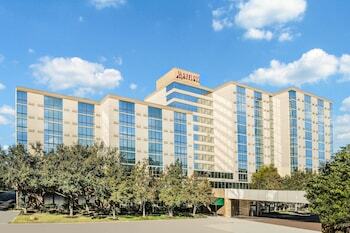 At Four Points by Sheraton Houston - CITYCENTRE, seniors often get 5-10% off the regular rate. For example, on December 8, 2018, a senior rate of $92.65 per night was offered. $89 per night found for a Room, 2 Double Beds, Pool View room type. For December 8, 2018, a special AAA rate of $89.38 per night was found for the AAA Rate, AAA Membership Card Required, - Exterior Corridors Double, Guest Room, Double, - Pool View, Cab room type. For December 8, 2018, a special Senior rate of $92.65 per night was found for the Marriott Senior Discount, 62 Years and Older - Valid ID Required, Exterior Corridors Double, - Guest Room, Double, Pool View, Cab room type. Four Points by Sheraton Houston - CITYCENTRE sells rooms through sites like Room 77, Expedia, Hotels.com, GetARoom, and many others. Room 77 searches across dozens of different sites to find the lowest discount rates available. The lowest rate we've seen over the last few weeks was found on . In 1% of the cases we surveyed, all sites offered the same rate. You can compare real-time rates from all of these sites on Room 77. Room 77 is the only hotel shopping site that includes special discounts like AAA, senior, government, military, and corporate rates.